I had never appreciated my Heavenly Father and my earthly mom as much as I do until I had children. It broadened my understanding of my relationship with them both in a much deeper and more intimate way. All that had been poured into me, I was trying so desperately to share with Sam and Sara, in obedience to the Lord’s calling in my life. That’s when He gave me Deuteronomy 6:4-7. Of course some days were easier than others, but day after day, I would remind them how much God loved them and that He would never leave them nor forsake them. I was constantly impressing upon them to seek God’s wisdom and direction in their lives. My children will tell you that I was always them that God hears their prayers, and He has a special plan and a purpose for their lives. I couldn’t tell them enough: Live a life that is pleasing to the Lord and brings Him honor. Of course, I still share with them but in a different way, as I trust and seek the Lord, and pray, pray, pray! Now that my children are in their 20’s, I realize how important those early years were and how I wish I would have done so much more to instill godly character in them, and to better prepare them for this ever-changing world that we now live in. But, God is faithful and I see His beautiful workmanship in each of their lives. I am so very proud of how God has molded and shaped them into His image, and that He was so gracious and loving to allow me be apart of it. Sharon is a wife, mother of two, and lives in Southern California with her husband of 30 years. Sharon is involved with womens’s ministries at her church and finds great pleasure in serving in the widow’s ministries. I have known Sharon for many, many years; her youngest child is the same age as my middle child (my oldest son). We have shared many life experiences together, some of those experiences define the word “challenging.” But Sharon has always been someone I could depend on for encouraging strength; she has a persevering spirit that leaves you feeling better that you spent time with her. 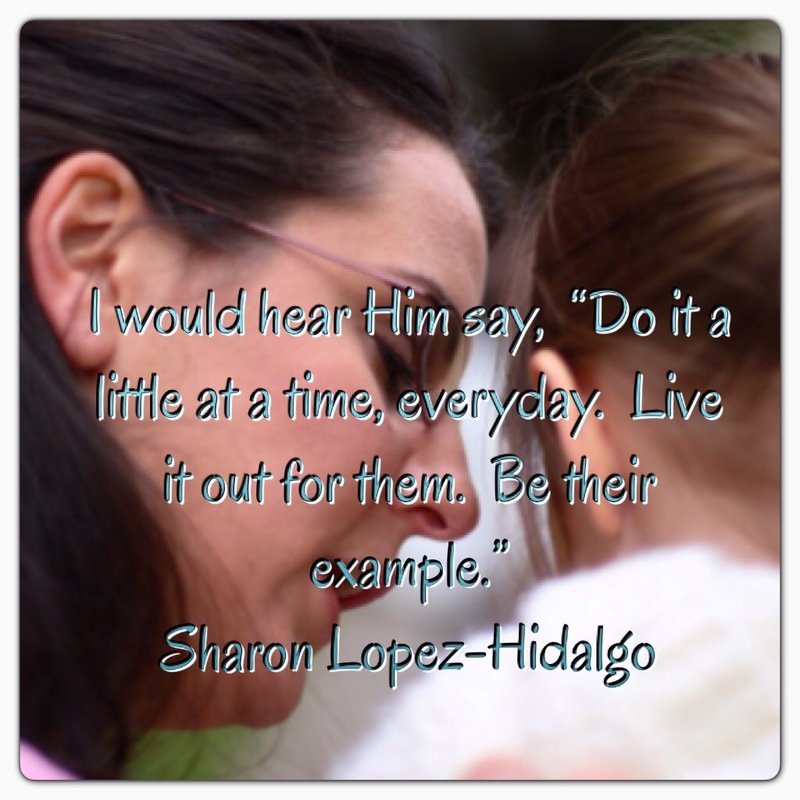 Sharon is one of those people who live out: “He is the lifter of my soul.” And she is ever ready to lift your spirit! You have always been such an amazing example to your kids and everyone who knows you. As my children became young adults, I too heard God confirm to me over and over again that my husband and I were to “be still” and “pray”. An old bumper sticker saying of “Let Go and Let God”. Never easy, but with great wisdom coming from the greatest Wisdom. Sharon’s example of living a life pleasing to God is exactly what Elizabeth Elliot was sharing in a CD I was listening to today. She spoke of her husband be a “simple man”. Not simple as in uneducated, but rather simple in being singularly focused in his life to “live a life pleasing to God.” Makes all those decisions that could be tough, much more simple. Oh Lisa how greatful I am for your friendship, wisdom and wise counsel that you have shared with me and my family! @Cuzn Sharon: Great article…thank you for the reminder of what we mothers need to do after we “train them up”…release to the Lord, and then pray, pray, pray…love it! Sadly, I already HAD that prayer for my eldest teen last year…where I was like, “Okay Lord…she’s YOURS to do whatever you need to do to get her back on track!” It was probably the saddest and most scariest prayer (to let go of ones child), but the most spiritual exhilarating feeling after to know that I DO TRUST God enough, and that I relinquished the control of trying to make her stronger in her faith before she heads off to college this fall! “High Five!” Sister!! When God “whispered” to me the women He wanted to Bless by blessing others with their motherhood contributions, it was NO surprise that Sharon was among them. I’m so glad her article touched you and that you can attest to her life in Christ to be consistent as her words. She IS a special person! I’m also happy that you’re enjoying the rest of the articles on TitusTwoTraining.org ~~ feel free to “pass it on” to your friends and extended family ~~ I’d love to have them drop in and join us here!